The number of active hate groups in the United States topped 1,000 for the first time and the antigovernment “Patriot” movement expanded dramatically for the second straight year as the radical right showed continued explosive growth in 2010. Several factors fueled the growth: resentment over the changing racial demographics of the country, frustration over the lagging economy, and the mainstreaming of conspiracy theories and other demonizing propaganda aimed at minorities and the government. The report is in the Spring 2011 issue of the SPLC’s quarterly investigative journal Intelligence Report. The Hate Map also contains a comprehensive, state-by-state listing of hate groups and their locations. 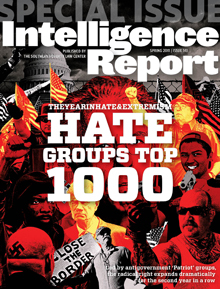 The SPLC documented 1,002 hate groups operating in 2010 – a 7.5 percent increase from the 932 groups active a year earlier and a 66 percent rise since 2000. It is the first time the number of hate groups has topped 1,000 since the SPLC began counting them in the 1980s. But the most dramatic growth in the radical right came in the antigovernment “Patriot” movement. These conspiracy-minded organizations, which see the federal government as their primary enemy, grew by 61 percent over the previous year. Their numbers increased to 824 groups in 2010, from 512 groups a year earlier. Previously, the only higher count of Patriot groups came in 1996, during the movement’s heyday, when the SPLC found 858 groups. Militias, the paramilitary arm of the Patriot movement, grew from 127 groups to 330 – a 160 percent increase. “Nativist extremist” groups – organizations that go beyond mere advocacy of restrictive immigration policy to actually confront or harass suspected undocumented immigrants or their employers – saw their numbers increase by 3 percent, from 309 groups to 319. Taken together, these three strands of the radical right – hate groups, nativist extremist groups and Patriot organizations – increased from 1,753 groups in 2009 to 2,145 in 2010, a 22 percent rise. That followed a 2008-09 increase of 40 percent. Mainstream politicians have promoted many of the ideas and conspiracy theories important to these groups. Last April, for example, Arizona Gov. Jan Brewer signed S.B. 1070, the harshest state anti-immigrant law in the country, setting off a flood of proposals for similar laws. State legislators also have offered proposals that would roll back birthright citizenship, bar judges from considering Islamic law in state courtrooms, institute an alternative currency, and even allow a state to disregard federal laws and regulations. Meanwhile, there are growing signs that the extremist movement is already producing significant acts of terrorism. In an 11-day period this January, a neo-Nazi was arrested as he headed for the Arizona border with a dozen homemade grenades; a terrorist bomb attack on a Martin Luther King Jr. Day parade in Spokane, Wash., was averted when police dismantled a sophisticated bomb; and a man who officials said had a long history of antigovernment activities was arrested in a car filled with explosives outside a packed mosque in Dearborn, Mich.
That’s in addition to the attempted assassination of U.S. Rep. Gabrielle Giffords in Arizona, an attack that left six dead that same month. The assailant appeared to be severely mentally ill, but he also seemed to have absorbed certain ideas from the radical right, including the notion that the federal government is evil. Last May, two police officers in West Memphis, Ark., were murdered when they stopped a van driven by a father-son team from the “sovereign citizens” movement, part of the larger Patriot movement. Eight law enforcement officers have been killed by radical-right extremists since President Obama was elected. The hate groups listed in this report include neo-Nazis, white nationalists, neo-Confederates, racist skinheads, Klansmen and black separatists. Other hate groups on the list target gays or immigrants, and some specialize in producing racist music or propaganda denying the Holocaust.